In 1972 an eminent group of intellectuals, The Club of Rome, commissioned the research skills of a group of scientists at the Massachusetts Institute of Technology to develop a model capable of engaging the question of future prospects for current economic practices. In response, they developed the computer program called World3. This program, combined with the new capacities of a super-computer, was able to calculate a great variety of principles applied to enormous quantities of raw data and thereby explore the potential 'carrying capacity' of the planet. They used such variables as various forms of resource depletion, efficiency of technologies, population growth, and pollution outputs among many other sets of data. Three main summary conclusions were offered in the report compiled by the research team utilizing World3 and their best attempts to include known assumptions of relevant data to the question at hand. 1 If the present growth trends in world population, industrialization, pollution, food production, and resource depletion continue unchanged, the limits to growth on this planet will be reached sometime within the next 100 years. The most probable result will be a sudden and uncontrollable decline in both population and industrial capacity. 2 It is possible to alter these growth trends and to establish a condition of ecological and economic stability that is sustainable far into the future. The state of global equilibrium could be designed so that the basic material needs of each person on earth are satisfied and each person has an equal opportunity to realize his or her individual human potential. will be their chances of success. This report produced a great deal of responses. This is for an obvious number of reasons such as the defense reaction of capitalist interests, but partly this was also due to the hype of the model being processed by a super-computer at MIT combined with the significant reputations of the scientists on the research team and the members of the Club of Rome. This context of the credibility of the scientists and a public fascination with the apparent pronouncement of doom from a super-computer, gave a sudden weight of critical realism to the environmental crisis. While there have been a number of valid criticisms of the modeling system used in World3, none of them have been able to fundamentally challenge the foundational principles of systems analysis used in the model. Changing the variables of the model could only offer a short-term forestallment of an eventual global population and industrial collapse. In 1991 this same team conducted the same modeling process using the data from the set of variables available twenty years after the first model calling it Beyond the Limits. Much of the conclusions remain the same and there is still room for optimism in the potential for change represented in conclusion 2. However, a number of important limits to growth have been reached decades sooner than expected giving rise to a greater sense of urgency. In 1971 we concluded that the physical limits to human use of materials and energy were somewhere decades ahead. In 1991, when we looked again at the data, the computer model, and our own experiences of the world, we realized that in spite of the world's improved technologies, the greater awareness, the stronger environmental policies, many resource and pollution flows had grown beyond their sustainable limits. The new report concluded that there were only two variables in the model which upon application could change the destructive course of events. The first is a comprehensive revision of policies and practices that perpetuate growth in material consumption and in population. The second is a rapid, drastic increase in the efficiency with which materials and energy are used. These conclusions are no doubt true and evoke a strong feeling of grim urgency to develop such solutions. Later in the thesis, the revolution of external limits of policy reform and technological efficiency required will be shown to only be truly possible when the inner limitations of the human world view are sufficiently understood and changed with an equally urgent determination. Prior to moving on to this aspect of the discussion, a brief examination of specific elements of the environmental crisis will be made. There are myriad aspects of the environmental crisis that negatively affect the quality of the human condition. However only a few examples of the main categories of degradation are sufficient to provide justification for the argument of this thesis. Throughout the world freshwater aquifer tables are dropping dramatically. Tragically, this is occurring with the greatest rapidity in the two countries with the greatest populations, China and at an even greater rate throughout India. The extraction of water from aquifers in India exceeds recharge by a factor of 2 or more. Thus almost everywhere in India, freshwater aquifers are being pulled down by 1-3 meters per year. This is in a country whose population is expected to increase by more than 64% over the next 50 years from 976 million to 1,517 million. This is a foreboding prospect in an agriculturally dependent country where three fifths of all children already suffer malnutrition. The resulting fall in water tables will eventually lead to a steep cutback in irrigation water supplies, threatening to reduce food production. Unless New Delhi can quickly devise an effective strategy to deal with spreading water scarcity, India-like Africa-may soon face a decline in life expectency. While in China, the implications of water depletion are equally devastating particularly for the negative potential impact on global food prices. In 1999 the water table under Beijing fell by 2.5 meters, representing a significant drop in water levels, while since 1965 the water table has fallen more than 59 meters. These water levels are dropping primarily in response to agricultural needs, both as the population continues to grow and the natural river systems are depleted. The cradle of Chinese civilization for thousands of years, the Yellow River, for the first time in recorded history, in 1972 it failed to reach the sea for fifteen days and since 1985 it has run dry for an increasing part of each year. In 1997 it failed to reach the sea for 226 days. By 2010 it is likely that China will have fully and suddenly depleted its underground water tables and the rivers will not provide enough for the agricultural needs. A rain based agriculture will mean that China will require massive importation of grain from other countries. 70% of China's agriculture comes from irrigated land, as opposed to only 15% for the U.S., combining this fact and that China, with nearly 1.3 billion people, a fast-growing economy, and a $40-billion-plus trade surplus with the United States, has the potential to disrupt world grain markets. In short, falling water tables in China could soon mean rising food prices for the entire world. Half of the forests that once covered the earth are gone. Between 1980 and 1995 more than 200 million hectares of forest were destroyed. With a sharply rising trend towards urbanisation, populations are more likely to be tolerant of clear cutting woodlands, rather than selective gathering patterns of rural based populations. This process of urbanisation causes a state of mental hyperseparation from nature. This among many other factors would indicate little to prevent a rise in a rate of deforestation. The current model of Western economics that developing countries are turning to only increases their intention to rely on fossil fuel based economies. Considering that Oil production will peak and then begin to rapidly fall sometime between 2000 and 2010, the implications are foreboding. This chart, representing data for the global production of oil, was compiled by Petroconsultants. This report was made on behalf of Oil industry interests and indicates the speed with which the growth of global consumption will outpace available resources obviously causing a very rapid increase in the price of oil. The report, written for oil industry insiders and priced at $32,000 per copy, concludes that world oil production and supply probably will peak < as soon as the year 2000 and will decline to half the peak level by 2025. 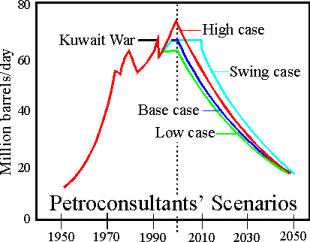 Large and permanent increases in oil prices are predicted after the year 2000. Without immediate massive investment in alternate, clean technologies, countries must produce more to pay for the rising oil prices which then increases the consumption of energy. A vicious and short lived feedback cycle begins where countries must increase their energy output in order to pay for increasing oil prices until we reach 'overshoot and collapse' and the industrial sector implodes. This occurs along with a corresponding impact on the loss of human population as the economic structures necessary to support the agricultural requirements of such a growing population disappears. Global warming, induced through human activity, has created ecological havoc on many levels, from massive erosion of the oceans 'tropical rainforests'- the coral reefs to extensive melting of thousands of square kilometers of polar ice sheets. Global warming has many negative implications. 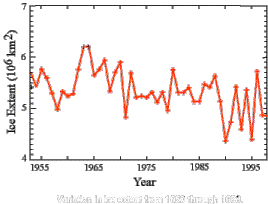 An illustrative example of combined data from 1950 to 1998 is provided below (also see the Arctic and Southern Ocean Sea Ice Concentration documentation for more information). While the quality of these data vary over time, the resulting time series provides a reasonable summary of hemispheric ice extent. These data suggest greater variations in recent years, with six of the 10 years of minimum Arctic ice extent having occurred since 1990. 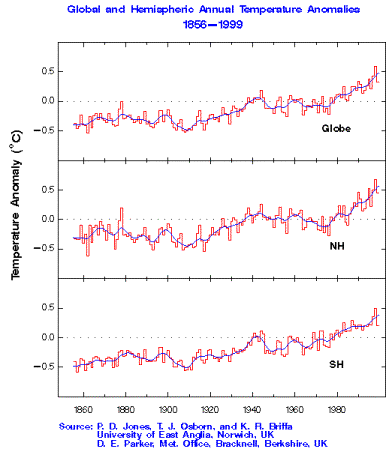 This graph indicates that seven of warmest years of the known global record were recorded in the 1990's, with 1998 being the warmest by an anomaly of .57 Celsius above average. The previously mentioned feedback system incorporating massive increases in unsustainable industrial output necessary to purchase the increasingly expensive oil can only negatively impact upon the greenhouse effect with the simultaneous release of massively increasing amounts of hydrocarbons. A combination of pollution, overharvesting, rising sea levels and increasing water temperatures are rapidly depleting the worlds fish reserves. ...11 of the world's 15 most significant fishing regions and 70 percent of the major fish species are overexploited. The global fishing harvest in 1997 was 90 million tons, yet as most marine biolgists believe, the oceans cannot sustain an annual catch of more than 95 million tons, the catch per person will decline steadily in the decades ahead as world population continues to grow. Most reports indicate ocean levels rising by at least 17 centimeters, but likely to rise up to 95 centimeters or even 1 meter by the year 2100. This would flood many major coastal cities from New York to Sydney, and wreak havoc in densely populated delta areas such as Bangledesh. Flooding, major storms and extensive forest fires continue to escalate in severity with each passing year. However, even more tragic than these climatic events which directly impact upon the human condition, is the rapid planetary loss of biodiversity. One of the first environmental crises which facilitated biocentric rather than anthropocentric considerations, which came to the forefront of public consciousness was the DDT problem, brought to our attention by Rachel Carson in the early 1960s. Since then there has been a proliferation of awareness that species other than humanity are suffering from environmental degradation. Based on an assumption of one million species, David Raup estimates a "background" or natural rate of species extinction at one species every four years. However, estimates of the current rates of species extinction range from 1000 p.a. to 4000 to 6000 p.a. with further projections that this rate may double or triple over the next few decades. Even the lower end of estimates of the extinction rate represent a period of mass extinction perhaps greater than on any other period on earth, and certainly the greatest in 65 million years. However, it is the first time it has been inflicted by a single species, rather than through natural events. Being "natural" of course does not necessarily mean "good". Whether it is the massive impact of a large meteor, or a modern day thermonuclear explosion, the effect is similar. However, it should be noted that "the fossil record indicates that several discernible mass extinction events occurred in the geologic past, but it also indicates that the rate of "background" or routine extinctions has declined with time and, correspondingly, that biological diversity has increased with time. On the average, speciation has outpaced extinction.The earth's evolutionary process tends toward greater biological diversity,...although it has been interrupted by widely spaced setbacks." Other than the news of it, this extinction rate, is not so obvious in our daily lives, and rarely gives us pause for thought. Earlier in human history humanity was particularly a rural species, and we lived more obviously within the same environment as "the rest" of the ecosystem. Under such conditions, the massive extinction of species would have had much greater impact upon our immediate psyche. But with a massive trend towards urban migration, projections indicate that well over half of humanity will live in cities by 2015, making it the first time in history for humanity to be categorized as predominantly an urban creature. This urbanization, literally, further separates humanity from nature and causes a further loss of sensitivity to the actual condition of interdependence among diverse species, particularly to their suffering and extinction. It should also be understood that a global estimate of a 54.4% urban-based population is misleading for the purposes of determining overall natural hyperseperation for two reasons. First, it is a global average. While the biggest shift towards urbanization is in developing countries, the projection is for industrial countries to have 80% urbanization. And most significantly, those in decision-making positions and those who determine environmental and economic policy, media focus, education curriculum, and so on, are almost exclusively based in cities. Considering this, the concept of urban/rural hyperseparation is much more pervasive than one might first assume. From this it is clear that the hopes for an unsolicited 'organic response' from the world's leaders in decision-making positions is unlikely. A dramatic shift in environmental policy is more likely to only occur after extensive public pressure and a united and diversely based education process, facilitated by all ecologically concerned groups. It is the nature of that education process which must be consulted upon. Conservation rests on insecure foundations as long as it does not go beyond an instrumental ethic for its justification. When conservationists try to oppose polluters and developers solely with pragmatic arguments about the value of species and the gene pools of the rain forests to human welfare they have been maneuvered into fighting on the same ground as their opponents. Their pragmatic arguments for the long-term value of a species will be weighed against pragmatic arguments for the immediate needs of human beings. If a judge rules that the arguments of the developers are more compelling and that a flood-control dam will provide more tangible benefits to humanity than will an endangered species, to whom will the conservationists appeal? ...The ethical principle that follows is that we should respect every entity for its intrinsic value as well as its instrumental value to others, including ourselves...We deal with entities appropriately when we rightly balance their intrinsic and their instrumental worth. The critical nature of maintaining this balance cannot be emphasized enough. Last century it was said, "we are nuclear giants and moral midgets". The discoveries in atomic physics released an enormous potential for both the advancement and destruction of both human civilization and the environment. The political metaphysics of most of that century unfortunately focused the lens of science primarily on its destructive potential. Motivated by the fevered insanity of these metaphysics, the finger of humanity moved a number of times towards 'the button' of global destruction, hovering millimeters away with hesitancy. To breathe a sigh of relief, concluding that that crisis has passed and that we are in a new and improved century would be folly. Not only does the prior 'button' exist, but primarily through political fragmentation in the East, there are more fingers with such capacity. As well the stability of the 'mercury switch' beneath the button has become frayed through a deterioration of economic and social structures, and a 'responsible military decision defending national interests' is no longer necessary for that spark to arc the gap of destruction. Acts of terrorism, partly inspired by growing disparities between extremes of social conditions throughout the world, necessitate the vigilance against the ongoing nuclear threat to the earth. This is not to deny that there are number of recognizable positive forces moving human civilization towards a positive integration of a global community, but complacency with the current model cannot be tolerated. If one is concerned with the preservation of biodiversity then it would be foolhardy to breathe a sigh of relief at the passing of the cold war potential and the apparent victory of the west. There is a new button. A new dimension of physical reality has been discovered. The capacity of bio-genetic engineering has released forces of potential creativity and destruction that dwarf the issues of ecological justice raised by nuclear physics. The nuclear form of destructive capacity represents an external force, capable of blasting, without any conscious selection, all of the earth. However terrible, and penultimate a form of destruction that may appear to be, there is something worse. The genetic form of destructive capacity represents an internal force, capable of deforming and changing the very fiber of being. Each member's creative freedom is potentially distorted, and the balance of its relationships with others impaired. Both forms of destruction are equally terrible in the capacity of their penultimate destructive capacity, that of extinction. Yet the potential of the genetic force represents a potential deformation and twisting of spirit so that such extinction means the loss of identity and internal integrity and impacts all relationships in the interdependence of the biosphere. Those who survive this type of extinction are not what they once were in a much deeper and complete sense than the survivors of atomic conflagration. In this context respecting and seeking to understand the sacred worth of 'every entity for its intrinsic value as well as its instrumental value to others, including ourselves' gains enormous implications for the application of ethics towards the positive application of the enormous capacity of biotechnology. This is because the sophistication of ethics required to meet the needs of this technology is much greater than that required for the application of nuclear physics. It is in this context of the requirement for the development of a sophisticated set of ethics appropriate to respond to the capacity of biotechnology that Bahá'í ecology offers one of its greatest contributions. As will be discussed in chapter 6, for Bahá'ís the loss of biodiversity and the distortion of individual identity has particularly tragic significance. Each species, and indeed each individual being, represents a unique expression of a spiritual attribute or set of attributes (i.e., names of God) arising from their relationship with other beings, in the contingent order. As each species becomes extinct, it does not merely represent the increasing imbalance in our ecosystem, or the loss of another potential pharmaceutical benefit, but the loss of diverse, beautiful and unique manifestations of God's Being in the contingent order. And if these species have never even been known, then we may have missed out completely on having the chance to ever know and learn from the expression of their particular spiritual attribute(s). As well, not only does the world lose the chance to experience the ongoing "becoming" or further development of their spirituality in ever-increasingly sophisticated and beautiful manifestations of God's Spirit in the world, but our own spiritual growth and richness is negatively affected. Since we are all who we are, primarily because of our spiritual and physical relationships in the natural world. In one sense, this process of unbridled mass extinction ultimately represents the initiation of the "death of God" in our world. The current dominant model of western economics and its attendant metaphysical assumptions, may have given us a 317.59% increase in the assets of the Dow Jones Industrial Average over the past ten years, yet it is causing the death of our world. Neo-classical economics has resulted in treating earth as a 'business in liquidation'. What is required is a radical change to this model. As Thomas Kuhn describes it, a 'paradigm shift' of inner metaphysics and perception is required of much greater significance than the Copernican revolution. A model is required in which global interdependence, complex levels of diversity, and the sacredness of all life is given due regard. Before moving on to a more in-depth discussion of such a valuing process in the Bahá'í model of ecology, the modern discussions about instrumental and intrinsic value of nature will be examined in a representative number of environmental philosophies. Particularly those of the 'radical ecologies' in order to understand humanity's current attempts at an appropriate analysis of the 'inner limits' of our ecological metaphysics which determine by projection, the nature of the external limits discussed earlier.